"Lane Miserables" was the eighth episode of the third season of Daria (episode number 308). It first aired on MTV on July 14, 1999. "Lane Miserables" was written by Anne D. Bernstein. Several members of the Lane family simultaneously return home, causing Jane and Trent to eventually seek shelter elsewhere. Vincent, Penny and Wind Lane make their first appearances in this episode, and Amanda Lane is fully revealed (her feet were seen in Arts 'n Crass). 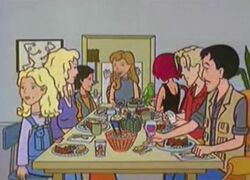 As Helen bemoans the fact that there's very little communication in the Morgendorffer family, the Lanes suddenly become cursed with too much of it as the various wandering Lanes return to the nest: Jane's mother Amanda Lane; Wind, when his third marriage hits the rocks; Penny (along with her psychotic parrot Chiquito), when her Costa Rican craft shop is wiped out by a volcano; and their father, Vincent, who's home to develop his photos of Celtic rock formations. Which is Trent as an overweight, unemployed bum, and her working double-shifts to support the family. That, she thinks, has killed her crush. Amanda finally can't stand having her wayward children around the house anymore, and in desperation, she pleads with Helen to help her get her home back. Helen's plan? A family dinner, where their bickering succeeds in driving the Lane siblings off once again to parts unknown. As Jane and Trent prepare to leave, Trent (who has broken up with Monique for the umpteenth time) comments to Daria that it's too bad she's not a few years older, otherwise he could take her out. With that, Daria's crush returns with a vengeance. This is a crucial episode for Jane and Trent: we finally see their immediate family, which had been just mentioned in episodes or in the books. "The Daria Diaries" and "The Daria Database" had already made it clear that Jane & Trent's parents were often absent and negligently so, and this was confirmed on screen. While Jane calls it "benign", it darkened the character's backstories. Trent's mournful memories of being in a tent for six months "waiting for someone to invite me back in" (which his mother remembers as an example of things sorting themselves out and where a young Jane was the one feeding him) shows this upbringing has left some marks. In a review of the series, Reihan Salam of Slate called this "one of the best episodes". He also points to it as an example of how Jane "clearly needs" the bond she's developed with Daria: running away to the Morgendorffers show "Daria has become Jane's surrogate family". Jake refers to a comic strip having Ash Wednesday, indicating this takes place near the beginning of Lent. The last episode seemed to take place in November, a big gap. The title is a play on Les Misérables, a classic Victor Hugo novel, which had been released as a major motion picture the previous spring. The names for Adrian & Courtney and Penny Lane's acerbic nature appeared first in "The Daria Diaries" book by Bernstein. This was the first time that off-screen canon material would appear in the show itself. Jake memorably thinks Quinn's date has arrived, and then discovers it's Monique (here for Trent) at the door - remarking "wow, I really don't know my kids!". He doesn't appear to be distressed or bothered by the idea of one of his daughter's could be a lesbian or bisexual. This is the only episode when Jane says amiga to Daria, but that didn't stop fanfic writers putting in every fic anyway! In the Latin American dubbing, Jane says "au revoir, mon ami". When Amanda speaks to Helen on the phone, it seems as if the two are well-acquainted. However, this is the first time in the series that Amanda had a speaking role and there was no indication previously that Helen knew Amanda. In the first scene, while Helen is cutting lasagna, Daria reads (and discuss) Jean-Paul Sartre's Being and Nothingness. Later, when the Morgendorffers are having dinner with Jane (before Trent's arrival) Daria reads another Sartre work, Nausea. This page was last edited on 9 January 2019, at 06:42.